I guess a theme is developing for this blog. I’ve been wanting to post some thoughts on Rick Warren, as his name keeps coming up in conversation. This blog is not about him or his teaching or church growth views, but it is going to be part of the foundation. Today driving in to the office, I was listening to this podcast on Ancient Faith Radio. The first thing that struck me was that the development of our faith is dependent on prayer and fasting. Actually, convicted is more the word. I definitely felt convicted, and was thinking again about this post, about how the purpose of the Church is creation of saints. For we are the aroma of Christ to God among those who are being saved and among those who are perishing. I want a bite of this, don’t you? However, if you were to smell it, you would discover it doesn’t have an aroma. 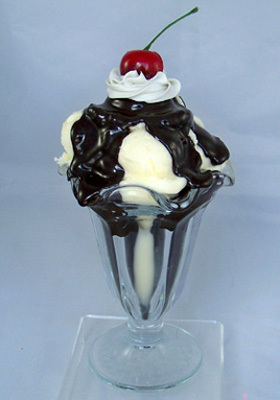 This particular sundae is fake. It is a prop. Depending on how the prop is made, it probably doesn’t have a taste, or it has a bad one. Sometimes, food looks good but smells really bad. Either way, the aroma reflects the substance. It is fairly easy to be a good looking Christian. Show up to church once in a while. Throw a few dollars in the collection plate. Put a couple of icons up in your house. It is much more difficult to smell or taste like a good Christian. In order to accomplish that, you need prayer and fasting. If we are concerned with evangelizing people, and as Orthodox Christians, we should be, then we need to be very concerned with becoming the aroma of Christ. Not only to lead people to Christ, but to also not drive them away with a bad smell, or a bad taste. This post reminds me of something that happened many years ago, interestingly to a non-Christian colleague. We were at a restaurant for dinner, and the waiter brought a tray of desserts by the table for us to see before we made a selection (or chose not to have one as we had just eaten a big meal, which is likely why the visuals). My colleague grabbed his spoon, stuck it in an apparent bowl of ice cream and put it in his mouth before the waiter could react. The “ice cream” was, in fact, pure lard. The dessert was a prop. The look on his face reflected the taste of the “ice cream”. We should all be concerned that when non-Christians sample us, they get what they see on the surface, not a bad taste. Copyright © 2019 Ancient Faith.